I really enjoyed Jesse’s first book, Living with a Seal. In that book, Jesse invites a Navy Seal to live with him for a month and train him. The result is hilarious and motivating, and you start to realize just how unique Jesse is. In this follow up book, Jesse goes on a similar adventure, this time deciding to live with monks to quiet his mind and take stock of his life. 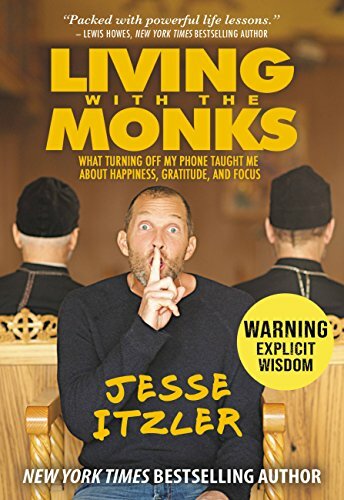 While humorous at times, and interesting to understand more about the way this particular group of monks lives, it felt like there was maybe 50% of a book here and Jesse needed to fill the rest of it up. I have a feeling that, if he had gone to one of these kind of monasteries, instead of one in upstate New York, it would have been a more entertaining (and difficult) experience. I’d recommend considering listening to his books on Audible, as he reads them and does a good job pulling you into the stories. You want to learn more about Jesse and Sara’s (his wife) background, as he spends a lot of time on both of their personal histories. As they’ve both been very successful, its interesting to learn more about how they did it.